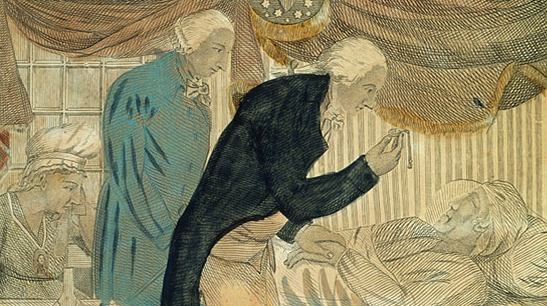 George Washington in his last illness attended by doctors, etching by an unidentified artist, early 19th century. The health of the two presidential candidates has become a major focus in this year’s presidential campaign. But what about the health concerns of our first commander in chief? “Every Necessary Care and Attention: George Washington and Medicine,” a traveling exhibit from the National Library of Medicine, is on display on the first floor of DeBartolo Hall on the campus of Youngstown State University. The exhibit, hosted by the YSU Melnick Medical Museum, runs through Nov. 4. Admission is free. The exhibit concerns the medical history of the first president, as well as his efforts to safeguard the health and wellness of his family, staff, slaves and troops. 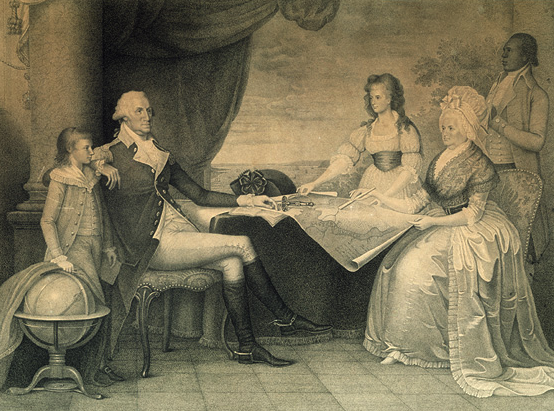 George Washington with his family, engraving by Edward Savage, ca. 1790–1798. “Washington’s story illuminates the broader context of the experience of illness and the practice of medicine, which during his time was transitioning from a traditional healer craft to a profession,” says the website for the exhibit. The exhibit includes six banners, each featuring literature and pictures relating to George Washington. It was developed and produced by the National Library of Medicine, National Institutes of Health and George Washington’s Mount Vernon Estate, Museum & Gardens. For more information on the Melnick Medical Museum at YSU, visit http://melnick.ysu.edu/.